This new trend among young Chinese couples is absolutely shocking to their parents. However, when you are young and in love but absolutely poor, what else is there to do? There are about six million students graduating in China every year. The pressure on those young people is huge. Unless they get help from their parents, they can’t get married and start their own lives. So, instead of waiting forever or spending their parents’ savings for the big day, young people in China have decided to go for a naked wedding. Basically, they just go to a photo cabin and take a naked picture together! That’s all! Such a fascinating idea! It is sooo romantic! It is just the two of you in the photo cabin. Of course, you could invite your parents to share the moment but it is highly unlikely they would attend. Both of you will remember the day forever! For sure! Plus, you will always have a good laugh when you look at the picture. 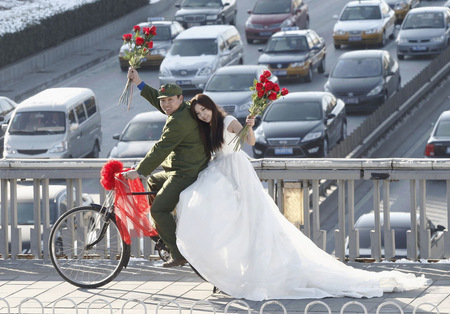 I recommend the new Chinese trend for all couples on a tight wedding budget worldwide. 3 Responses to Naked wedding ceremony? !